On Aug. 11 and 12, 2017, hundreds of self-identified white nationalists staged a “Unite the Right” rally in Charlottesville, Virginia, where they were taped chanting anti-Jewish and anti-Black slogans. This chilling display of hatred was unfortunately not unique in American history. In 1939 around 20,000 Nazis attended a rally in Madison Square Garden in New York City. But what happened next is equally instructive. More than twice as many counterprotestors opposed the march. And in less than a year, the Nazi leader was in jail and the group was effectively shut down. U.S. president Franklin Roosevelt opposed the rise of Nazism from the very beginning, calling it a “cancer.” So when a German immigrant named Heinz Spanknöbel formed the pro-Nazi Friends of a New Germany in 1933 in order to coerce German-American newspapers and organizations to support the Nazi party, it attracted unfriendly attention from the U.S. government. The House committee on Un-American Activities began investigating the group, which had the blessing of Rudolf Hess. In less than a year’s time, Spanknöbel had been deported for failing to report his status as an agent of a foreign government. Berlin ordered FONG to disband in 1935. The following year Fritz Julius Kuhn, an autoworker at a Ford factory, founded the German American Bund in Buffalo, New York to take FONG’s place. Born in Bavaria, Kuhn had been awarded an Iron Cross while serving in the Germany Army during World War I. After a stint in Mexico he had emigrated to the United States in 1928 and become a citizen six years later. Supposedly a cultural organization for Americans of German descent, the German-American Bund’s primary mission was to promote Nazi discourse and practices. Kuhn ranted that Jews and Communists were an insidious threat to social order and racial purity. The Bund’s thousands of members wore Nazi uniforms and performed the Hitler salute with an extended right arm. Seeking to boost his organization, Kuhn and 50 followers traveled to Germany and had their photo taken with Hitler during the Munich Olympics in 1936. Failing to speak at length with the German leader or his cronies, Kuhn nonetheless returned to the United States falsely claiming to have been enthusiastically received by numerous Nazi officials. Despite its attachment to Hitler, the Bund draped itself heavily in the American flag. Kuhn extolled George Washington as “the first fascist,” claiming the revolutionary general to be a military “man of action” who “knew democracy could not work.” The Nazis also admired white supremacist movements such as the KKK in the United States. Indeed, Hitler had expressed admiration for how the KKK had “policed” racial purity through terrorism and murder targeting Black Americans. The Bund extracted tremendous revenue from its thousands of members by requiring them all to purchase Nazi uniforms, copies of Mein Kampf and subscriptions to a monthly fascist newspaper. In return, the Bund organized Nazi-themed training camps with names like Camp Nordland, Hindenberg and Siegrief in states with heavy German-American populations, including Pennsylvania, New York, New Jersey and Wisconsin. The camps not only indoctrinated adults, but also inducted children into its version of the Hitler Youth. The Bund wasn’t just summer camps and fascist children’s activities. Thousands of members participated in a paramilitary wing known as the Ordnungsdienst modeled on the thuggish Brownshirts in Germany. These Storm Troopers perpetrated attacks on Jewish businesses, and when Jewish-American veterans of World War I confronted them in counter-protests, violent scuffles often broke out. But Kuhn’s crudely direct politics were actually embarrassing to the German foreign ministry, as they agitated anti-Nazi sentiment at a time that German diplomacy focused on smoothly obfuscating the brutal nature of Nazism so as to minimize American willingness to intervene in a European conflict. Kuhn’s events inspired tens of thousands of counter-protesters to mobilize against the Nazis. As a result, Berlin refused to provide direct material or rhetorical support to the Bund. The Bund’s activism reached its peak on Feb. 20, 1939, when Kuhn organized an enormous rally in Madison Square Garden in New York City which attracted 22,000 supporters. This “Mass Demonstration of True Americanism” was supposedly in honor of the birthday of George Washington. The Bund draped a giant banner depicting the first U.S. president in between American flags and Nazi swastikas. Between 50,000 to 100,000 counter-protestors confronted the Nazi rally, including Jewish war veterans and anti-Nazi Germans. It took 1,700 NYPD officers, many mounted on horseback, to keep the groups apart, pushing back several attempts by the anti-fascists to storm the gathering. When a Jewish hotel worker named Isadore Greenbaum charged Kuhn as he gave his speech, Kuhn’s storm troopers beat him up badly and tore his pants off to the cheers of the rally-goers; he only escaped with his life due to intervention of the NYPD. Kuhn himself managed to dodge the punch. The fascist demagogue proceeded to give his typical hate speech denouncing the “Jewish threat to the white race,” leading attendees in a Hitler salute, and describing Roosevelt as a pawn of capitalist Jewish financiers who, of course, were also secretly Moscow-backed Communists. Tellingly, Kuhn defined who qualified as “real Americans” and who didn’t based on race. Kuhn must have thought the rally a tremendous success. But in reality, it had won him powerful enemies. The FBI had already led an investigation seeking to verify if Kuhn was a foreign agent—the charge which had caused the dissolution of FONG. However, Berlin had issued a statement in March 1938 forbidding German nationals from participating in the Bund. Prior to the ban, around one quarter of its members were German citizens. When Kuhn traveled to Berlin to protest the ban, he was shown the door. As Kuhn was genuinely not acting at Germany’s behest, it was implausible to try him for doing so. However, New York City mayor Fiorello La Guardia went fishing for other grounds by which the Bund leader could be held culpable—and an audit revealed that Kuhn had embezzled $14,000 — that’s nearly $245,000 in 2017 dollars — out of his own organization, in part to pay for his multiple mistresses! Ironically, the members of the Bund reportedly felt that the illicit skimming was Kuhn’s right as the group’s Bundfuehrer. 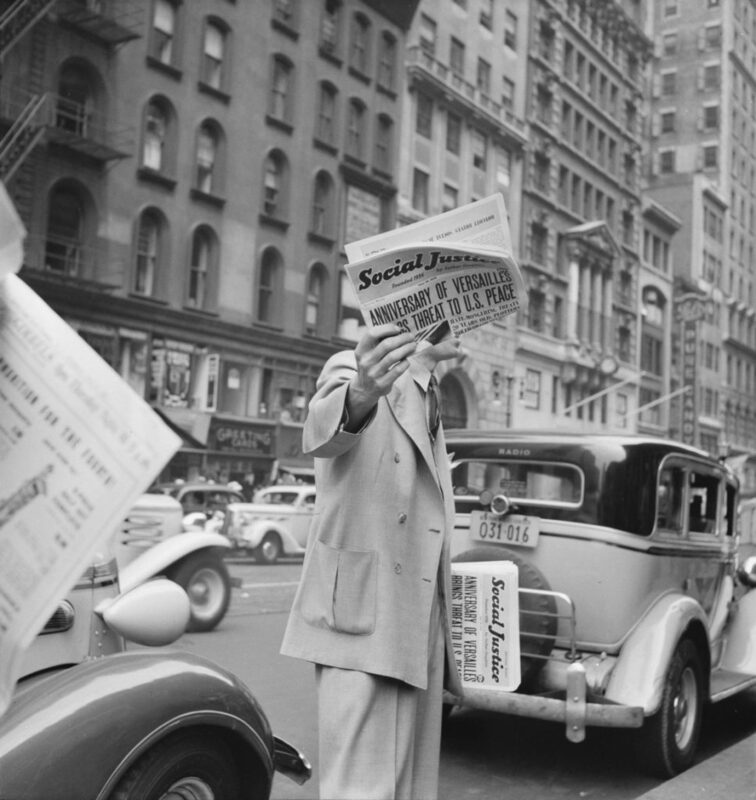 But New York district attorney Thomas Dewey pressed charges anyway, and by December 1939 Kuhn was being packed away to serve two and a half years in Sing Sing prison for tax evasion and embezzlement. The Bund gradually disintegrated in his absence, and the state arrested Kuhn’s successor Gerhard Kunze as well as 24 other members in 1941 for seeking to undermine U.S. military conscription. Despite the frightening peak size of the Bund, it failed in its mission to bully most German Americans into supporting Nazism. Indeed, polls suggested they were not especially more likely to be pro-Nazi than other Americans were. Many prominent German-Americans such as journalist Dorothy Thompson—a heckler at the Madison Square Garden rally—would prominently denounce Nazism in the 1930s and ’40s. While the German American Bund served as the overt face of American Nazism in during the 1930s, there were other prominent U.S. citizens sympathetic to fascism that promoted anti-Semitism and aided Hitler’s foreign policy objective of keeping the United States neutral. Later in 1938, a German consul awarded the American automaker the Grand Cross of the German Eagle, a medal reserved for foreigners sympathetic to the Nazi party. Ford later attempted to distance himself from the key role his publication played in popularizing and legitimizing anti-Semitism across the world. However, he campaign against U.S. involvement in World War II under the guise of pacifism coded in anti-Semitic language — the war was part of the agenda of greedy “foreign financiers.” He even claimed that American ships torpedoed by German submarines prior to the outbreak of hostilities were sabotaged by a pro-war conspiracy. Despite Ford’s supposed anti-war stance, the Ford Werke branch in Germany continued production of vehicles under American management even after Hitler began his military conquests, and used French slave laborers captured after the fall of France. Lindbergh’s diary entries demonstrated that he accepted many Nazi ideas about preserving white “racial strength” against “Asiatic” races—and agreed that there was a “Jewish problem.” It is true that Lindbergh also disapproved of Nazi violence, and saw himself as promoting American interests, not Germany’s. During World War II, Lindbergh reenlisted in the U.S. military and flew combat missions in the Pacific Theater. Nonetheless, prior to American entry in World War II the famous aviator chose to use his star power to actively campaign against American support for the Allied powers. 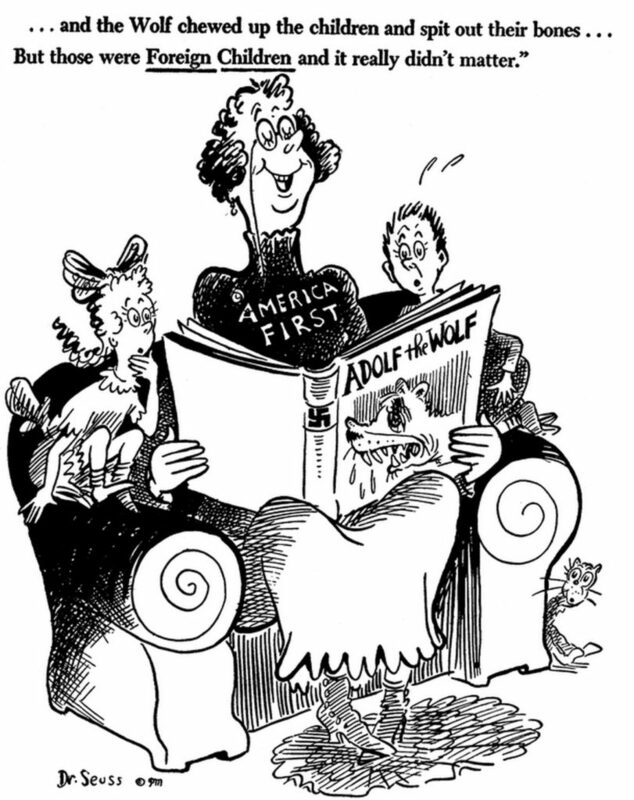 He did so as a leading speaker of the America First Committee which sought to cut off American aid to England during the early years of World War II, before the U.S. became involved in open hostilities. Members of the America First Committee had a variety of motivations. Some were dedicated pacifists or isolationists that wished nothing to do with oversea wars, no matter the justification. Joseph Kennedy, the father of the future U.S. president, was notoriously antisemitic and was an isolationist convinced Hitler would defeat the United Kingdom. Inconveniently, for the Roosevelt administration, the Kennedy was also the U.S. ambassador in London! Other American Firster’s held varying degrees of sympathy for fascism, including the pioneering female aviator Laura Ingalls, a Nazi true believer who was arrested in December 1941 for receiving money from the German embassy to promote non-interventionism. Even American Communists were under orders from Moscow to support the America First Committee because of the Molotov-Ribbentrop Pact allying the Soviet Union with Nazi Germany. Of course, official support changed to opposition after the German invasion of the Soviet Union in June 1941. Another influential American extremist was Father Charles Coughlin, a popular Catholic radio preacher who attracted tens of millions of listeners to his fiery screeds denouncing Jewish financiers as Communist agents. The Irish Catholic expressed admiration for Hitler and Mussolini and vehemently criticized Roosevelt’s efforts to support European democracies against Nazi Germany. Coughlin undermined his own occasional equivocations about fascism, such as when he justified Kristallnacht as an act of revenge by downtrodden Christians. As the United States became increasingly involved in the Allied cause, government officials began restricting Coughlin’s radio broadcasts until he lost his permit to broadcast entirely in 1940. Threats of a prosecution eventually pressured the priest into ceasing political activity entirely in 1942. Ford, Lindbergh and Coughlin saw both sides as the problem. Yes, the Nazis were violent, they might concede, but hadn’t they been provoked by the “Jewish problem”, the wicked Communists and a belligerent France and United Kingdom? Clearly there were plenty of Americans in the 1930s and 40s that either sympathized with the Nazis, or who were willing to make excuses for them and sabotage efforts to fight them, trying to cast the warring parties in an aura of false moral equivalency. However, those sympathizers and enablers proved to be a minority. Americans didn’t fight Nazis by complacently standing by and imaging they would go away if they were simply ignored. 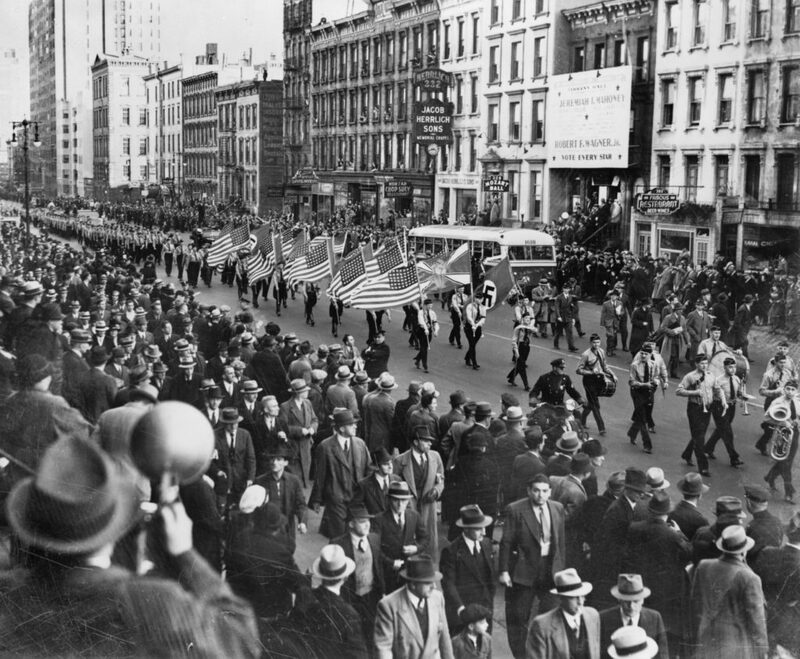 Tens of thousands of U.S. citizens protested and confronted Nazis on the streets. And politicians and security officials arrested and expelled foreign-sponsored agents seeking to subvert U.S. foreign policy, shut down fascist propaganda outlets, and targeted domestic leaders of the Nazi movement until it fell apart.